Fancy a quick, easy way to extend the flowering period of your summer borders for free? Then a pruning method that’s been branded as ‘the Chelsea chop’ could be your answer. 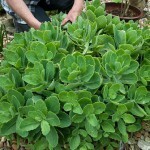 So called because it’s carried out in Chelsea Flower Show week (late May), as well as delaying flowering, it also makes your plants more compact, produce more numerous blooms, and negates any staking requirements, too. 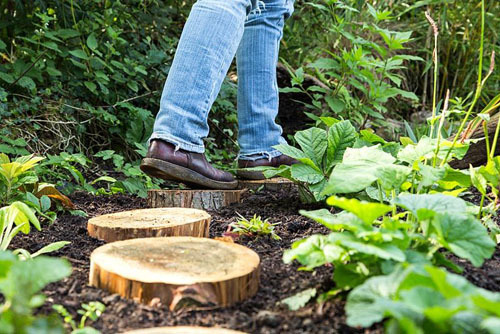 All in all, it’s a pretty handy trick to keep up your horticultural sleeve. So, how do you go about this deliberate decapitation? It’s really quite simple – but you need to be feeling brave to do it. Faced with a sea of lush stems, it takes a leap of faith to then chop them back with shears to half their height, but trust us, that’s all you need to do. 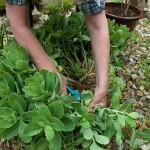 Ensure your tools are sharp, make the cuts and then rake up and compost the stems – or use them for softwood cuttings. 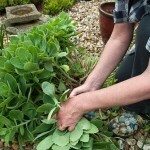 Faced with a large clump, try cutting back half the number of stems only. 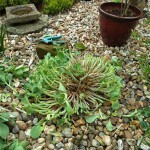 That way the uncut shoots will flower first, then the pruned ones will follow on shortly. 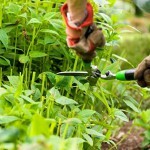 Many plants are happy to be cut back in this way, especially herbaceous perennials. Phlox, rudbeckias, echinaceas, heleniums and sedums are all happy to go under the knife. The Chelsea chop should, if we’re being official, be a term only applied to these late flowering perennials. However, there’s nothing to stop you applying it to early flowering plants, too. Hardy geraniums, centaurea, alchemilla and aquilegias can all have their blooms delayed by cutting the shoots back – just jump in during the first two weeks of April instead. This entry was posted in Expert advice, Garden Shows, Practical gardening on April 30, 2015 by gapadmin. Adding a water feature to your garden will bring so many different elements to your outdoor space – sound, movement, reflection and, of course, wildlife. Excavate and fill a pool, and you’ll be amazed how quickly it will be colonised by amphibians and aquatic insects. But then, to survive in the wild creatures need to be opportunistic, so don’t be surprised when they lock on to this promising area like a magnet. Early spring is the ideal time to construct a pool because it will rapidly establish to offer wildlife an invaluable breeding ground. Water will warm quickly, allowing the life it contains to proliferate with ease. 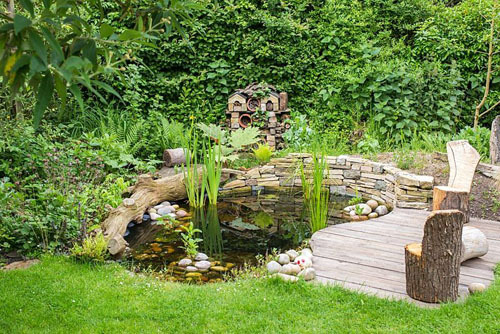 The design and construction of a wildlife pond is different to that of a more formal water feature. Here, we follow the process step by step, looking at these aspects individually. Position your wildlife pond in a semi-shaded area, not full sun. The mix of stronger and weaker light will provide a diverse environment in which lots of wildlife can find its niche. Keep the hole away from tree roots, if possible, as these may pierce the liner as they grow (bamboo can be particularly troublesome in this respect). Mark out a kidney or similarly curved shape using a garden hose – this will provide ample space for creating shelves and slopes. 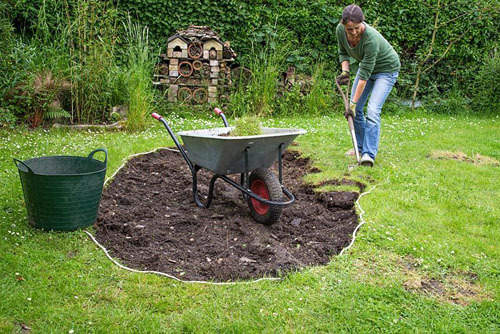 Cut out the perimeter using a spade, then carefully lift the vegetation from the remainder of the hole (if digging in a lawn you can create a turf stack). Begin creating different depths to your pool. Around some of the margins, create shelves upon which marginal aquatic plants can be positioned. You’ll also need a deeper central area. 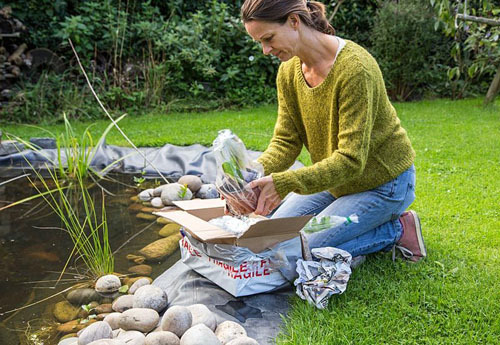 This can be useful for large plants such as waterlilies, and it will also ensure there is a cooler pocket of water in the centre of your pond. This offers diversity for wildlife and prevents the water heating up too quickly in the spring, which can lead to problems such as excessive algal growth. While you can buy rigid, preformed pools it is easier and often cheaper to line your pool with a butyl liner which can be moulded to any shape. 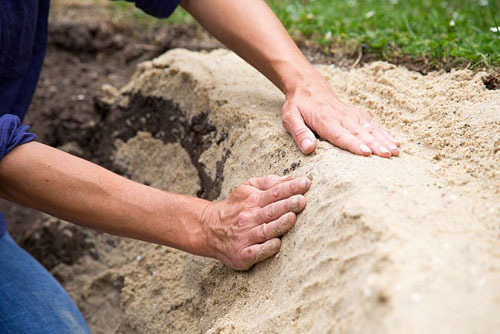 In either case, line the sides of your excavated pool with a 2-3cm layer of playsand. This will provide a cushioned base upon which your liner can sit. Dampen the sand slightly if it proves difficult to pack against any vertical sides. Carefully lay your liner into the hole. When using butyl try to minimise creasing as you position your liner. Begin filling your pool with water – rainwater from butts is ideal but tap water is fine. 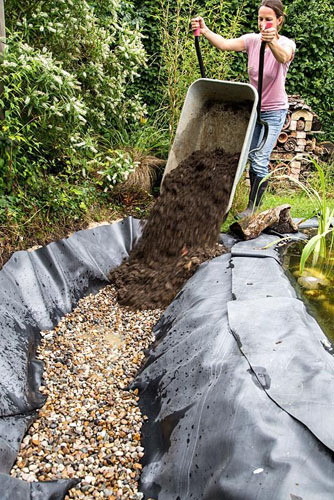 As the water level rises carefully pleat the liner to create equally spaced folds, repeating the process until the pond is full. Don’t be tempted to trim the liner until the pool is fully topped up as it may constrict with excess weight. 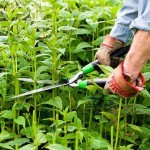 Then, using sharp scissors, cut off the surplus, leaving enough so that you can place paving slabs or other edging on top. If room, you can also create a bog garden adjacent to your pond to further boost diversity. 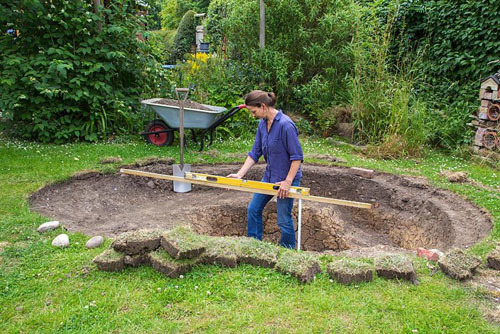 Excavate a 50cm deep hole, line it with butyl, pierce the base multiple times with a garden fork and then fill with an 8-10cm layer of pea gravel. 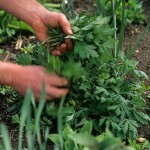 Top this off with a 50:50 mixture of multipurpose compost and good garden soil. You can then plant up this bed with moisture-loving plants such as candelabra primulas, skunk cabbage (lysichiton), rheums and astilbes. Adding extra features will improve the look of your pool and create more habitats for wildlife. Logs, whether in the water or alongside it, will quickly be colonised. Raised beds can be planted with moisture-loving plants, and cobbles and stone walls will be a favoured basking spot of reptiles. Creating a sloping edge of pebbles and gravel into the water will offer a transition area for aquatic life, a drinking and bathing area for birds, and an escape route for any land mammals misfortunate enough to fall into the water. Once all the hard landscaping is complete you can begin planting up your wildlife pond. Choose native plants where possible, and those with single flowers – this will attract the widest range of creatures. A mixture of bog, marginal, floating and deep aquatic plants will also help here – specialist aquatic mail order nurseries are a godsend. Marginals such as miniature bulrushes, water mint and flag iris can be planted in mesh pots. 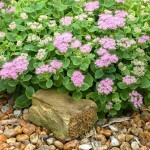 Use aquatic compost which is rich in nutrients, and be sure to top off the pot with coarse gravel to keep it in place. Gently sink the pot onto your pool’s shelf and weigh it down with large cobbles. Unanchored plants such as water soldier and elodea can simply be placed into the water. Get a friend to help you lower plants such as bog bean and water hawthorn into deep water if you have created a large pool: thread a length of rope through the pot, and stand either side of the pool to lower it into position. Adding a decking area will offer you the chance to sit by the pond and observe the creatures that it attracts – a well deserved reward for all that hard work! Fix it securely to the waterside using sunken vertical posts, and add some rustic seating that you and your aquatic companions can both enjoy. To see this feature in full please click here. 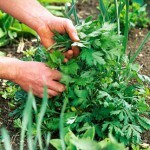 This entry was posted in Expert advice, Practical gardening on April 28, 2015 by gapadmin. Winter is finally over which means you can finally get out and enjoy your decking like it was meant to be enjoyed. That isn’t always quite the case however as winter can take its toll on decking quite heavily. However by following these tips you can soon get your deck ready for use again. Wooden decks are especially volatile if they are not treated correctly. Following a wet, cold and snowy winter then it is essential that you check the wood of the decking itself, and the frame underneath to make sure that no areas have rotted or become unstable throughout the winter. If they have then take note of where they are and as soon as dry weather comes have the section replaced. It worked for pirates and sailors, it will work for your decking. By removing stray leaves, fungs, moss, mildew and any other unsavoury winter build-up on your deck can save you a lot of time and effort, and money in the long run. It isn’t enough to simply jet wash your deck after winter, and requires a full and thorough cleaning – yes this means between the cracks – before it can be spring and summer ready. It is recommended that you add a protective coat or finish to decking before the winter comes in. However if you didn’t get the chance to do this now is definitely the time. 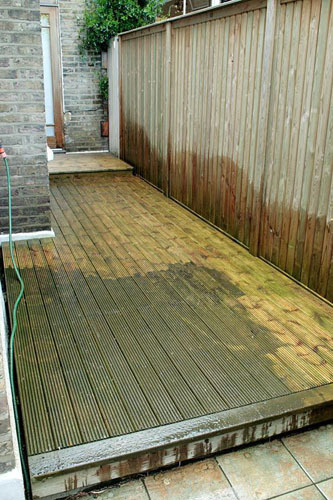 Once the decking is scrubbed clean and dried you can coat the decking that not only protects the wood from things like rot but also enhances the colour back to its former glory. It is a lot of work but definitely worth it when you see the life put back in your decking. And that’s all thankfully. 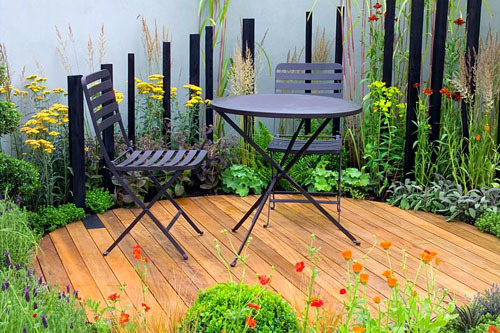 Once your decking is coated and back to working order you can return the furniture to it (if you left out garden furniture over the winter take note of where the feet were sitting as this is the most likely place for deck damage). That should see your decking ready for a new season of use. 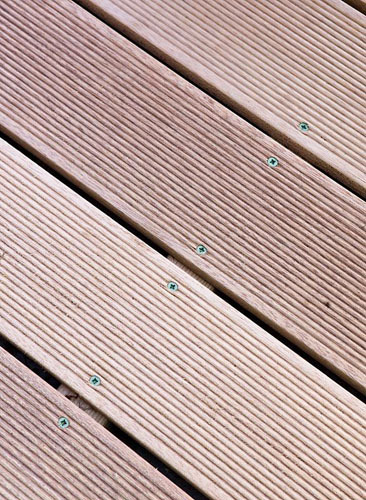 Do keep in mind though that if you are tired of the constant treatments and scrubbings and coatings or if you need to replace your old deck it may well be worth considering composite decking as a viable, long-lasting and low maintenance alternative to your existing deck option. This entry was posted in Expert advice on April 23, 2015 by gapadmin.